I’ve driven by some streets multiple times before I finally force myself to swerve in the direction of the art I’ve spotted there. For months, I knew about this piece but never got the chance to photograph it up close. Finally, much to the consternation and fear of my surprised passenger, I turned around a few streets to snap a picture of this piece. 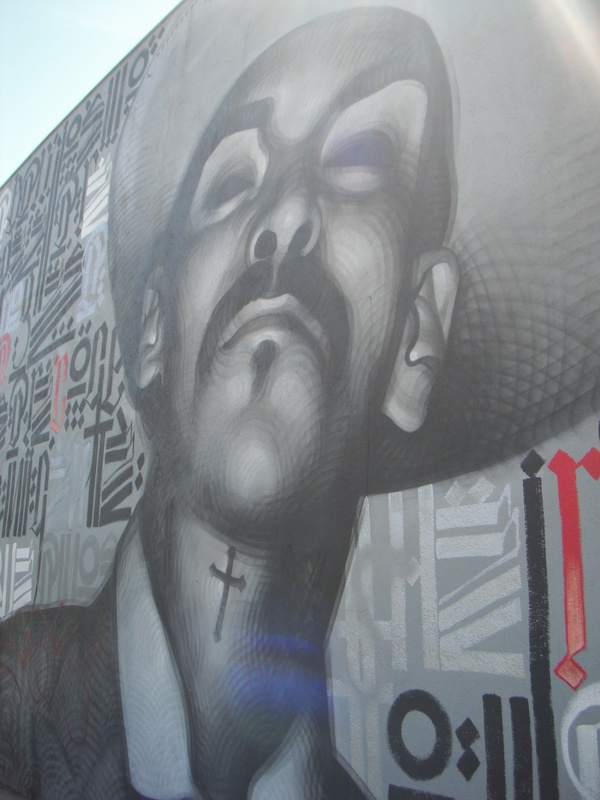 The mural is another awesome creation by artists El Mac and Retna. You can see some photos of them working on the mural, which they titled “The Knight,” here. The two have teamed up plenty of times and provided Los Angeles with some really intricate pieces. 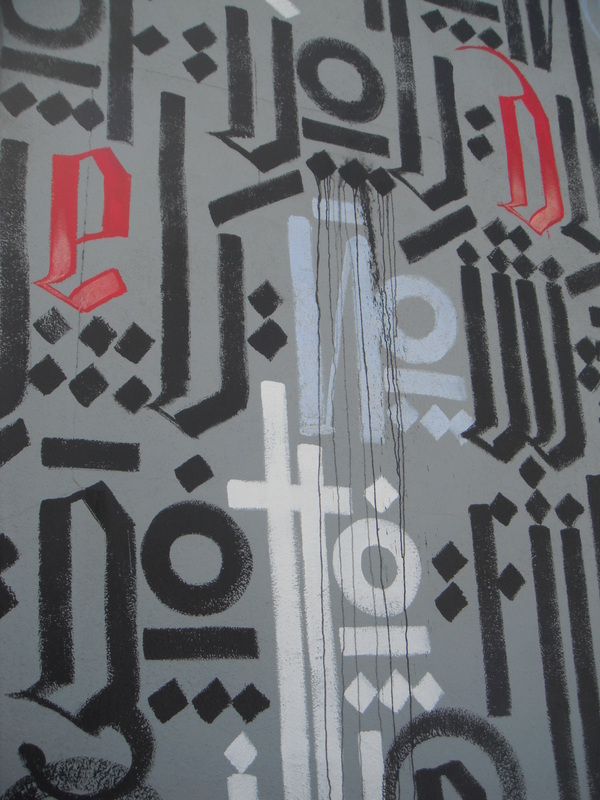 Retna does the lettering in the background, while El Mac tackles the figures. 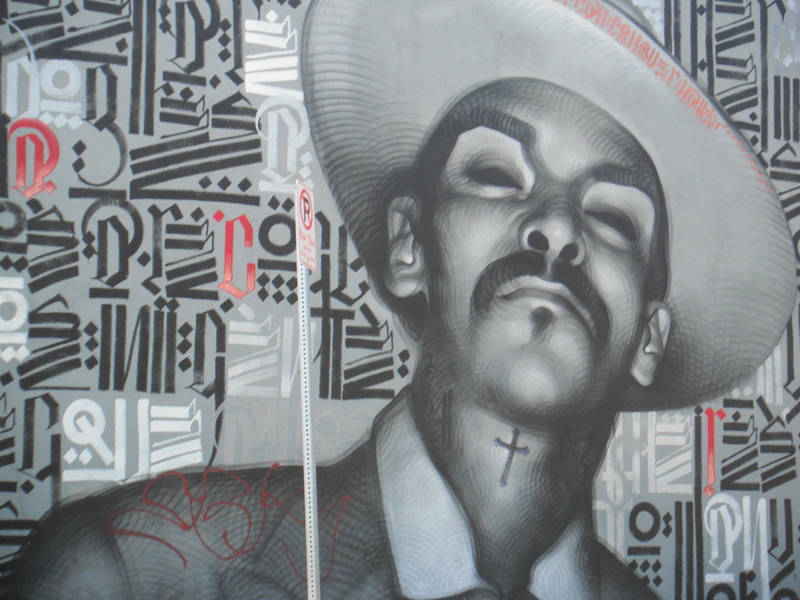 Both artists create complex pieces that fit beautifully together; you can look closely at Retna’s letters and try to find a pattern while discovering some detailed swirls on the surface of El Mac’s figures. I’m sad about the tag that’s over the piece, especially since I don’t remember seeing it before. Either way, you can’t cover up all the great details within the work. Sure makes parking, biking and walking through here a completely different experience. That’s the best part about talented artists taking to the streets – it changes your perception of the streets around you, simply through the power of a single mural. 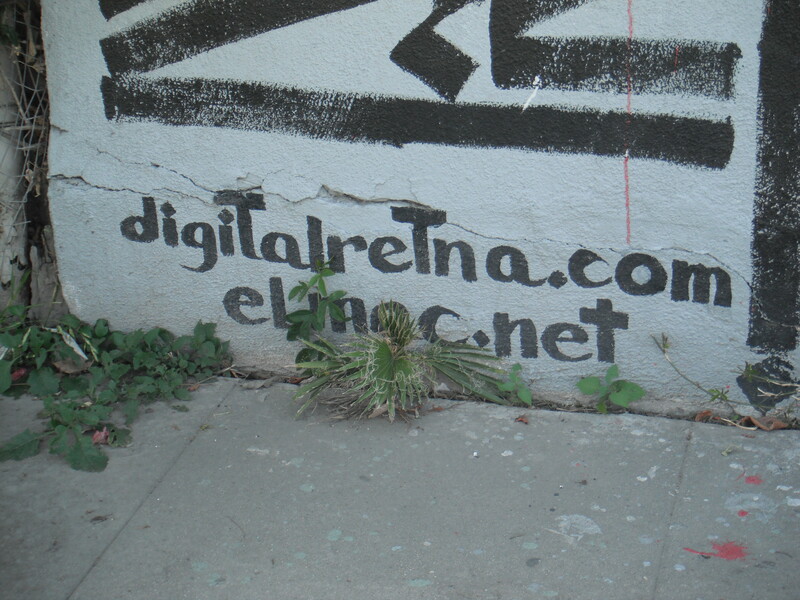 This entry was posted in street finds and tagged art, el mac, los angeles, Retna, street art, the knight. Bookmark the permalink. Mindblowingly wild! One of the best! I love the use of cross-hatching in the figure, and the glyphs are hot. I do wish they filled the bit of space over the figure’s right shoulder. Regardless, this is very classy, contemporary and masterful work. That you for shooting this and posting it! Well worth the diversion to get some photos! Very much so. Even with the looks some passersby gave me!